It took hundreds of years before standard medieval medical practices like blood-letting, exorcism of devils, spells, incantations, and a proscription of bathing were replaced by modern medicine. Conference programming consisting of one person lecturing at many has been our standard meeting model for hundreds of years. One day I think we will look back on this tradition and marvel about how we could believe for so long that it was the best thing to do at meetings. 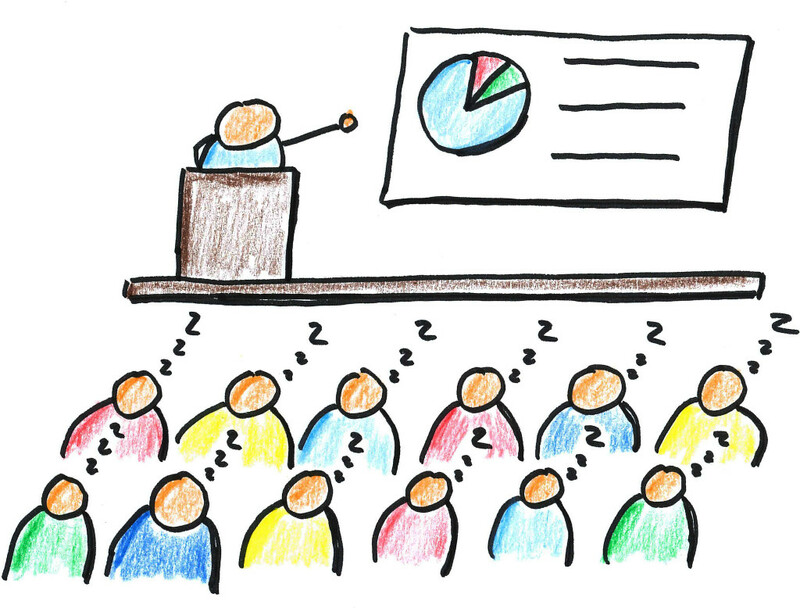 The fundamental flaw of traditional meetings is that most of the time only one person—the lecturer—is active while everyone else passively listens. Despite the fact that everyone who’s ever taught a class knows that the best way to learn anything is to teach it, we rarely use participatory session formats where everyone gets to “teach” their understanding, questions, and points of view—and, as a bonus, gets to meet and connect with other participants with whom they share common interests. I think most people don’t use participatory session formats because they aren’t aware of them and, even when they are, don’t know how to use them effectively and/or are scared of doing something perceived as “different”. Luckily, an increasing number of people are “having the guts” to create and use powerful processes (e.g. World Café, Open Space, Art of Hosting, and, yes, Conferences That Work) that incorporate what we now know about how people effectively learn, connect, engage, and come to action. All the above meeting formats are about twenty years old (although they all build on much older informal process). We now possess tools to make fundamental meeting change happen. My professional life mission is to promote awareness of such tools, work on improving them, and encourage and support their increasing use. Join me and a growing number of others in our mission to fundamentally enhance the quality and value of meetings, one meeting at a time. This is another post in the occasional series How do you facilitate change? where we explore various aspects of facilitating individual and group change. This entry was posted on Monday, August 18th, 2014 at 6:29 am	and is filed under Facilitating Change. You can follow any responses to this entry through the RSS 2.0 feed.You can leave a response, or trackback from your own site.